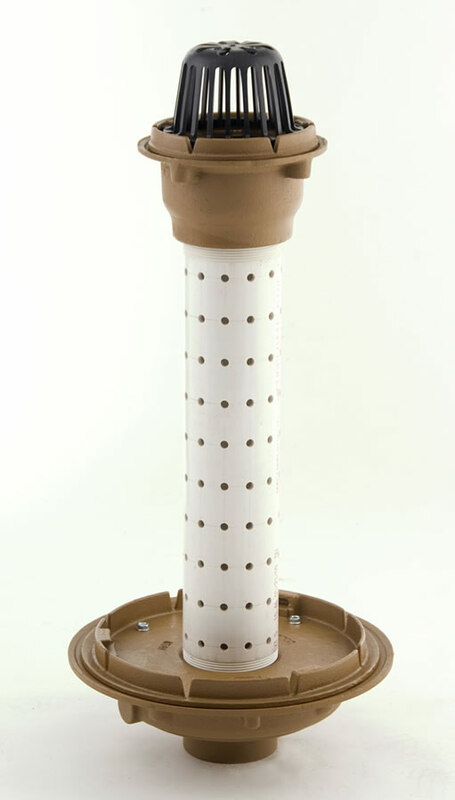 Planter Area Drain for Multi-Levels - Jay R. Smith MFG Co.
15 1/4” Diameter drain with perforated standpipe. Medium (8 1/2 Dia.) surface or planting area drain. Standpipe allows limited sub-surface drainage. Reduced Energy Consumption and Maintenance– The roof top plants and/or cool roof materials increase the insulation in the building and reduce heat transfer into the building thus lowering utility rates. Green roofs can reduce energy consumption of a building by up to 20%. Reduces Urban Heat Island Effect –This is where there is an increase in ambient temperature in cities because paved areas and buildings absorb more heat from the sun than natural landscape. Green roofs help insulate and shade buildings, and the plants can help cool the atmosphere around them. Duco Cast Iron Lower Body and Flashing Collar with 4(100) PVC Perforated Standpipe and Duco Cast Iron Upper Body with Combined Flashing Clamp and Gravel Stop with Polyethylene Dome.